Is there any third party application available in Windows 7 which will enable Windows 8 metro screen in Windows 7? 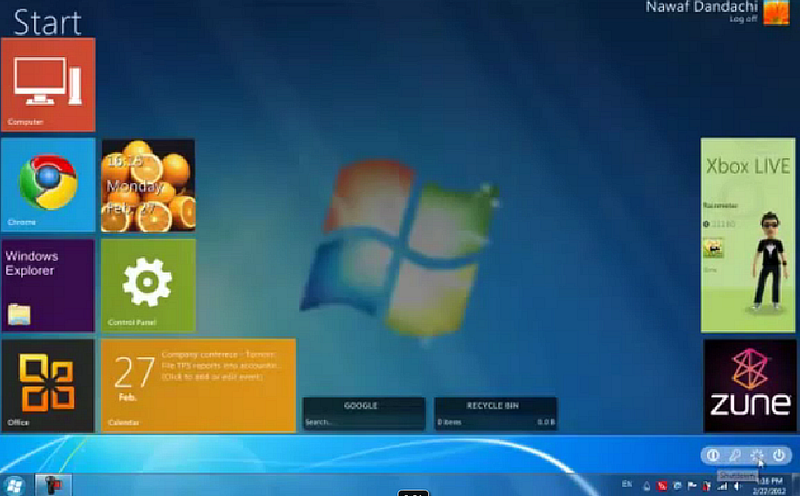 Is there any third party application available in Windows 7 which will enable Windows 8 metro screen in Windows 7? So that I won’t install Windows 8 in my system as metro screen is the real difference between them. Can you also tell me how to install and use it? Do Windows 8 OS supports themes? Can we download different varieties of themes for the Windows 8 Metro Screen from Windows Store? What is the procedure to pin Folders to Metro Screen of Windows 8? Re: Is there any third party application available in Windows 7 which will enable Windows 8 metro screen in Windows 7? There is one such kind of application which may enable windows8 metro screen in windows 7. The name of the application is rainmeter. 1.It displays customizable skins right on your desktop. 2.Many skins are active in rain meter which can record your notes and to-do lists or even control the media player. 3.You can rearrange and customize the icons according to your liking. 2.Now run the executable file and follow the instructions on the screen to install the rain meter. 3.Now download the skin of windows metro UI. 4.Load the windows 8 metro screen with the help of rain meter and enjoy feeling of windows 8 in windows 7.
you can use Newgen software which is a freeware Metro-style launcher for Windows that is designed to bring the start screen of Windows 8 to your desktop. After install, launch the application from the start menu or click the Newgen desktop icon. You will be presented with the metro-style start screen (in full screen). In the start screen, you can put tiles, widgets and also pin application and website to the start screen. By default, there are three tiles/widgets available – the time widget, store widget (where you can download other widgets) and the Newgen widget. Also, at the upper right of the screen is the user tile. You can change the user tile with your photo. To add more widgets to the start screen, click on the Store widget. You will be presented with all the available widgets for download, including Twitter, Gmail, Weather, Hotmail and more. Newgen supports WPF, HTML5, and HTML widgets. After you have downloaded the widgets, you can add them as tiles by left-clicking on the right edge of the screen to call up the Start Menu, then right click again to display context menu. Click on Add Tiles. You can pin application and website too. On top of that, you can customize Newgen to your liking in the Settings page. Windows 8 uses winRT platform for metro screen which is present at kernel level. And windows 7 is not using any winRT library. so there is not any software available to enable windows 8 metro screen in windows 7. Can we mount ISO files in Windows 8 without any third party application installed? How to do it?